The Iraqi government on Tuesday approved draft legislation lifting immunity for foreign private security companies, sending the measure to parliament, a spokesman said. The question of immunity has been one of the most serious disputes between the U.S. and the Iraqi government since a Sept. 16 shooting incident involving Blackwater USA guards that left 17 Iraqi civilians dead. Iraqi government spokesman Ali al-Dabbagh said the draft law approved Tuesday would overturn an immunity order known as Decree 17 that was issued by L. Paul Bremer, who ran the American occupation government until June 2004. "It will be sent to the parliament within the coming days to be ratified," al-Dabbagh told The Associated Press. "According to this law, all security companies will be subjected to the Iraqi criminal law and must obey all the country's legal regulations such as: registration, customs, visas, etcetera." Al-Dabbagh did not single out Blackwater but said: "According to this law, all security companies will subjected to the Iraqi criminal law and must obey all the country's legal regulations such as: registration, customs, visas, etcetera." U.S. Embassy spokeswoman Mirembe Nantongo said she had not seen the measure and had no immediate comment. The embassy has said it was waiting for the results of investigations. Prime Minister Nouri al-Maliki has promised to push through the measure amid growing public anger over the Blackwater shootings in Baghdad and a series of other Iraqi civilian deaths allegedly at the hands of foreign contractors. Meanwhile, CBS News has learned the State Department promised the Blackwater guards involved in the September shooting immunity from prosecution in its investigation before taking their testimony. Law enforcement officials say they can still be prosecuted, but former prosecutor David Laufman said it will be harder to make a case, CBS News national security correspondent David Martin reported. Blackwater, based in Moyock, N.C., is the largest private security firm protecting U.S. diplomats in Iraq. It has said the Sept. 16 convoy was under attack before it opened fire in west Baghdad's Nisoor Square, killing 17 Iraqis. 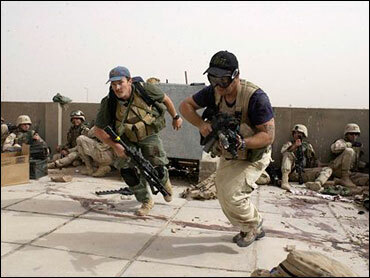 A follow-up investigation by the Iraqi government, however, concluded that Blackwater's men were unprovoked. No witnesses have been found to contradict that finding. An initial incident report by U.S. Central Command, which oversees military operations in Iraq, also indicated "no enemy activity involved" in the Sept. 16 incident. The report says Blackwater guards were traveling against the flow of traffic through a traffic circle when they "engaged five civilian vehicles with small arms fire" at a distance of 50 yards. Blackwater's contract with the State Department expires in May and there are questions whether it will remain as the primary contractor for diplomatic bodyguards. The monthly toll of U.S. service members who have died in Iraq is on track to being the lowest in nearly two years, with at least 34 American troop deaths recorded as of Tuesday - nearly a third from non-combat causes. But the military cautioned it's too early to declare a long-term trend. In all, at least 3,840 members of the U.S. military have died since the Iraq war started in March 2003, according to the AP count. Iraqi civilians faced more attacks on Tuesday. At least four mortar rounds slammed into a village near Saddam Hussein's hometown of Tikrit, killing a woman and wounding five other civilians, police said. Gunmen in a speeding car tossed a hand grenade into a crowd of shoppers in eastern Baghdad, killing one person and wounding five, according to an officer in the capital. Turkish Cobra attack helicopters blasted suspected Kurdish rebel targets Tuesday near the southeastern border with Iraq in a second day of fighting in the area. Prime minister Recep Tayyip Erdogan, seen at left, said an escalation of military action was unavoidable. Three soldiers and six rebels have been killed in fighting, according to local news reports. The government called a Cabinet meeting for Wednesday to discuss possible economic measures against groups supporting the Kurdish rebels, private CNN-Turk and NTV television reported. Turkey is reportedly considering a string of economic actions against the self-governing Kurdish administration in Iraq's north, where rebels are based. Meanwhile, at least 34 American service members have died so far in October, the lowest number since 32 troops died in March 2006 and the second-lowest since 20 troops deaths in February 2004, according to an Associated Press count based on military figures. That would be the second consecutive drop in monthly figures, after 65 Americans died in September and 84 in August. He also singled out the cease-fire call by radical Shiite cleric Muqtada al-Sadr, who in August ordered his fighters to cease attacks against U.S.-led forces and other Iraqis for up to six months. He said Iraqi forces also were increasingly taking charge of security operations. Danielson welcomed the lower numbers but stressed it was too early to say it was a downward trend. Ten of the American casualties, or nearly one-third, were listed as non-combat so far this month, compared with 19 of the 65 American troop deaths in September. The U.S. military usually doesn't provide details about the causes of non-combat deaths in its releases, and Danielson said they could comprise anything ranging from vehicle accidents to suicides. He said he could not immediately discuss whether the numbers of such deaths were unusual, although he calculated that about 82 percent of the overall casualties since the war started through Oct. 19 were from hostile fire or bombings. "Either way it's a tragedy. We want to prevent both," he said. In August, the U.S. Army expressed concern that repeated deployments and tours of duty that have been stretched to 15 months were putting increasing pressure on military families and creating record suicide rates among soldiers.